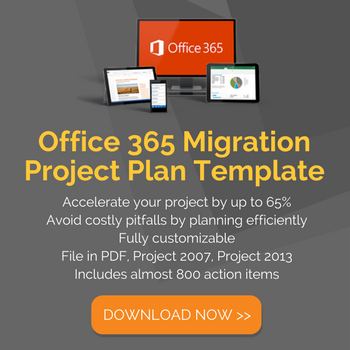 In November 2015, I calculated the per device cost to migrate from Windows 7 to Windows 10 — a whopping $693 per seat for a manually delivered migration using spreadsheets or hand-cranked databases! In comparison, Gartner had quoted somewhere between $1,035 and $1,930 per user depending on the level of desktop management in place, and Forrester estimated $1,000 as the average expense. With Juriba Dashworks software, we were able to reduce this figure significantly (on average to $493 per seat). While our Win 7 to Win 10 calculation was based on a hypothetical 10,000 seat migration project, it was built from real-world experience of having helped enterprises ready millions of devices for migration. As companies move to continuous upgrades rather than big bang migrations, the focus of these calculations shifts as well. This week, Gartner has been first to market with a new cost model, the so-called "Windows 10 Feature Update Cost Model", which is available for purchase for $7,500 on the analyst company's website and consists of an Excel spreadsheet and an accompanying report. It outlines how the ongoing maintenance cost compares with the big bang migrations of the past. The goal is to allow large organizations to estimate the costs and labor requirements involved for managing one or two Windows 10 Servicing cycles a year. Update Sept. 2018: Microsoft has updated its Windows 10 Servicing support model. All currently supported Windows 10 Enterprise and Education editions (versions 1607, 1703, 1709, and 1803) receive 30 months of total support. Starting with 1809, all Fall Feature Updates will be supported for 30 months, while all Spring Feature Updates will continue on an 18-month support schedule. Effectively, Microsoft has relented to customers' and analysts' pleas and now "allows" enterprises to switch to a 12- or even 24-month deployment cycle. Organizations must move from running infrequent projects to upgrade Windows every six to eight years to having a continuous process to qualify and push out updates every six to 12 months, This results in a different pattern for staffing and budgeting. 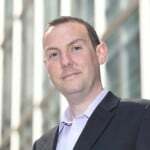 Tasks that used to be done in a separately funded project - possibly with help from a service provider - become a task that must be done continuously, probably by existing IT staff." Largely Unmanaged. In the first scenario, the majority of the company's devices aren't managed very tightly so that end users are able to install applications or change settings however they pleased. Locked & Automated. The second scenario is the opposite: Devices exist only in the tightest-managed way possible, what Gartner calls a "locked and automated" environment. According to the report, while there is a significant difference in cost between unmanaged and managed environments, there is only a slight difference in the cost of going through a yearly upgrade cycle compared to a large big-bang migration project every six years. For those not familiar with the Windows 10 servicing cycle, this strategy is often referred to as 'skipping a release'. Unmanaged Device: The cost to upgrade once every year over a six year period would run about $77 per upgrade (or a total of $462 for six migration cycles). This represents a 4% increase over the $445 that Gartner estimates it would cost to upgrade once at the end of the six year period big bang style to a new version of Windows 10. Locked & automated environment: Not surprisingly, a closely managed device is less expensive to upgrade. The cost per PC per upgrade comes in at just $43 per upgrade, or $256 over the entire six year reporting period, which is a minimal increase of 1% over a big bang migration costing a total of $258 per device. But Costs Almost Double With Two Updates A Year! Unmanaged Device: If the company increases their upgrade frequency to the two recommended updates a year, the cost per PC per update goes down to $66. However, this results in an overall increase of 78% over the entire period ($792 vs $445). Locked & automated environment: At $42 per PC upgrade, the cost savings per device and upgrade for closely managed PCs aren't as great as the savings for unmanaged devices, but multiply that by 12 upgrades over a six year time span and costs suddenly skyrocket by 97% ($504 total)! Please note that the migration cost from Windows 10 to Windows 10 is significantly lower than the one from Windows 7 to Windows 10 because Gartner assumes that enterprises will have to do a lot less application testing and re-packaging as application compatibility issues for new versions are considered negligible by Microsoft. It is also worth pointing out that while IT used to carry most of the migration cost, users now have to shoulder a lot of the responsibilities and costs for testing applications as part of the new user piloting process for testing updates. A few months ago, we speculated if Microsoft was going to give in to the cries of customers and analyst houses like Gartner, who has been lobbying for a while that Microsoft should allow customers more time (24 months) while reducing the number of updates to one feature update a year. In fact, many organizations are already skipping every other update. But while Microsoft has extended its support by an additional 6 months for previous versions, it recently stood firm that version 1803 will retire Nov. 12, 2019 — after only 18 months. In the near future, we will be releasing our own, proprietary cost modeling tool (free of charge) based on 6 million migrations we have helped our clients facilitate. We strongly believe that, through automation and an iterative improvement cycle, the costs can be kept to a minimum and the productivity and security benefits gained by a faster upgrade cycle outweigh the added costs. At Juriba and within most of our large customers, there has been growing recognition that Windows 10 Servicing management is something that will need dedicated resources, tooling, and processes to manage. 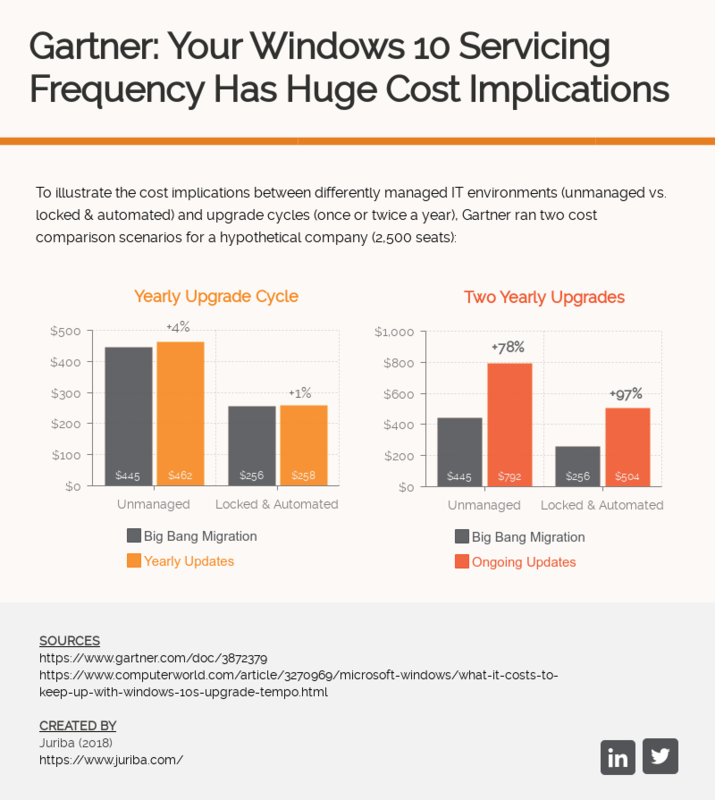 Gartner's cost model for ongoing Windows 10 management is the first time that we have seen external analysis that these Windows 10 upgrades are going to require significant budget. If we take a large enterprise and extrapolate out these results for a locked environment (in reality there would be some economies of scale), an annual budget to manage two upgrades per year would require an annual budget of $840,000. That is a significant amount of money for organizations to find, especially if they had not realized that this would even be an issue for them. Until this point, many organizations have simply believed that this will be a Business-as-Usual (BAU) activity, swallowed by our existing IT teams. Gartner has effectively dispelled that myth with their model, and validated the fact that Windows 10 to Windows 10 feature release upgrades will have a significant impact on the organization. Now, more than ever, the right tooling will be essential in keeping these costs to a minimum, and we would strongly advise that you take a look at our Dashworks product to help prepare for maintaining Windows 10 in an Evergreen cycle.